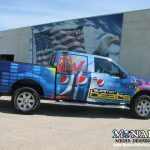 Vehicle wraps and graphics have become increasingly popular in the past 20 years. 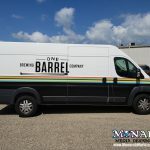 One thing that has not changed is the need for clients, designers, and advertising agencies to be educated on ways to make the vehicle wrapping process go smoothly. This will save time and money for you and/or your client. 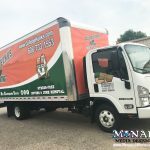 At Monarch, we have our own in-house vehicle wrap designers that are experienced in proper assessment of vehicles, accurate template setup, printing, production, and vehicle wrap installation. 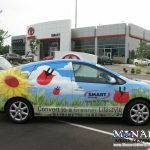 Over the years, we have designed a lot of partial and full vehicle wraps, as well as we have printed and installed designs provided by our clients and their in-house design teams or advertising agencies. It can be great to get files from other designers, and sometimes it can be a nightmare for all involved. There are some crucial steps to take that are easy and will save so much time and money in the long run. You will be happy that you took a few extra steps to make sure your files do not incur more design fees for you or your client if we have to adjust them. If we can tell you anything that will help even if you just stop reading this article right now…that would be to FEEL FREE TO CALL US!! We are not scary! We are fun and happy and ready to explain to you what we need from you in order for things to turn out like you are anticipating. Ask us questions about what size and resolution your file needs to be in. A couple things you should know BEFORE you call us. First, we need know what type of vehicle it is that you are designing. It’s important to have the make, model, year, color, and any other specific information you have about the vehicle. Second, we need to know the amount of coverage that is going on the vehicle. If you don’t know what vehicle or what you want, we will not be able to provide you with much pricing information. You will get this key information in one of two ways. 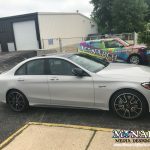 The first way is to have someone from your company bring the vehicle to our shop and we will personally measure, take photos, and assess the vehicle for you. ~OR~ If you are unable to come by prior to getting some pricing information, you will need to take photos, measure, and assess the vehicle yourself. You want the photos to be “head-on”, especially from the sides and rear. The straight plane of the photo should be running parallel with the sides and bottom of the vehicle you are shooting. If you are at a weird angle, this is going to skew the shape of the vehicle and cause for the layout to be inaccurate. The entire view of the vehicle needs to be in the frame. Do not crop off wheels or take multiple photos of partial views of a vehicle. You may have to move it or pull it out so you can get a really good, straight-on photo, but it will make a difference. Any kind of camera should be fine. Most smart phones take pretty good photos and those will be fine for creating templates. Make sure that the photos are in good lighting so you can see the shapes and curves. A super accurate vehicle wrap requires a lot of measurements for all of the key areas of a vehicle. We don’t expect that you will have all the exact measurements, and we always check files for placement before printing. In the beginning though, we basically need to know the approximate measurements in order to give you a price quote. We definitely need the height and length of the area that is going to be covered. Roof and bumpers are always going to add more as well, so keep everything in consideration. No amount of information is too much when it comes to measuring. A few inches can mean hundreds of dollars of difference on an estimate. If you say you have an 8′ high box truck, but it’s actually only 7 1/2′ high, that is huge savings. A price may seem high and it could be because you provided inaccurate measurements. Walk around the vehicle. Are there any dents or cracks? Is there any paint chipping or rust spots? These are all things that can affect the longevity of the wrap. 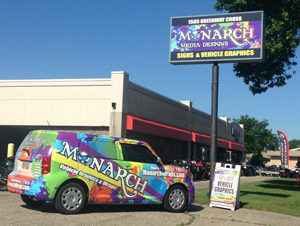 A lot of clients will prefer to have some of them fixed prior to having the vehicle wrapped. Wrapping over cracks or rust will only harm the vehicle, especially when the wrap is removed. It will bring up any loose paint on the vehicle. Pay attention to the position of the gas cap, door handles, window and body trim, and other extrusions and accessories. You do not want any important information to end up going over these areas. Depending on your wrap, partial or full, it may land over the vehicle emblems. We recommend taking off any that are removable. Wrapping over these can cause cracking, tearing and peeling away over time and can show the paint color of the vehicle. If you are the client, then decide if you would like them removed. Most can be ordered back from a manufacturer if needed after the wrap. Not all bumpers can be wrapped. And some that can, may not need to be. Larger, extruding bumpers are going to take more material and more installation time. Some vehicles that have chrome bumpers, don’t usually get the chrome wrapped over. It makes a huge difference on some of the vehicles whether or not they have rivets. Not sure what a rivet is? Read our article about them here. Vehicles with rivets must use our premium wrap vinyl. This is going to affect the installation time because there are steps before and after the wrap in order to secure the vinyl around these rivets. For trailers, the rivets are most often removable before the wrap, then we replace them after the installation is complete. The most important thing to remember is to BRING THE VEHICLE TO US to assess if you are not comfortable with doing all of these steps yourself. This is the most effective way to get a quote and to let us help you setup your files in the proper size and format. We ask that you keep us in the loop of the entire process so we can help you avoid little mistakes before submitting your final files. Keeping us informed and letting us help you can make the project fun and easy! We’ll Help You Wrap It Right! The Monarch team takes the steps necessary to make sure your wrap is right!